Drone technology and popularity have literally reached the sky the last years. Their complexity and level of advanced technology have increased, their field of usage has exploded and their availability never been better. At Elmatica we have been solving PCB challenges for this exciting industry for years. This week our Danish Country Manager, Torben Hajslund participated at an inspirational seminar with Danish defense about drones, arranged by UAS Denmark, and FAD. 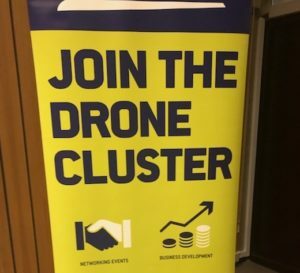 Presentations about drone technology, how will it look in 10, 20 or 30 years, for sure showed that this is an industry that peeks one way, upwards. Drone forecast predicted that we will have about 7 million drones in the air by 2020. The next generation of drones is already underway, as 3D Robotics announced the world’s first all-in-one Smart Drone called Solo. Smart drones with built-in safeguards and compliance tech, smart accurate sensors, and self-monitoring are the next big revolution in drone technology that would provide new opportunities in transport, military, logistics, and commercial sectors. A crucial factor for the quality and application possibilities of such drones is the built-in sensor technology, offering endless opportunities on what kind of technology you can fit into the drone, but also rising the demands for high-quality PCB and components. “PCB applications for the drone industry require high reliability. We have been a trusted PCB supplier to the military and commercial drone industry for decades, providing printed circuits according to the materials, constructions and environmental challenges that are approved for the industry. Listening to the lectures at the UAS Denmark meeting, just confirmed my impression that the drone technology is constantly evolving, and undergoing groundbreaking progressive improvements, emphasizing the importance of early involvement and close relation between the involved parties producing drones”, says Country Manager for Elmatica in Denmark, Torben Hajslund. When talking about drones, size matters. Our team of Senior Technical Advisors is often involved in the production process of new drones, for both military and commercial use. “As a general rule, we can say that it’s with drones as with Space/Satellites and Avionics, small devices require low weight and offer minimal space to design on. The solution is often a thin polyimide Rigid-Flex to be able to avoid space demanding contacts and keep the weight down. This result is HDI with narrow traces, microscopic isolation distances and extensive usage of mVias”, says John Steinar Johnsen, Senior Technical Advisors at Elmatica. “In extreme cases, a DIE can be used directly on a PCB by connecting it by wire bonding. It saves space and weight. When designing printed circuits for drones we use our experience from the aerospace and automotive industry, where high quality and function test are equally important”, Johnsen finishes. Low weight on the printed circuit is key. A thin Rigid Flex is a necessity due to limited space and keeping weight low. Limited space inside the drone might offer the need for more creative designs of printed circuits. Involve the expertize at an early stage of the design process, this might save you for re-designing later in the process. Interested in learning even more about Flex and Rigid-Flex? Read here. IPC celebrities and high temperature in task group discussions! Why a PCB-standard in the universe for Medical Device Applications is a hard... Pixabay Learning more about FAR regulations – reporting from US!